The Montenmedio golf (6260 meters, 18 holes, par 72) is unique and different from all spanish golf courses. 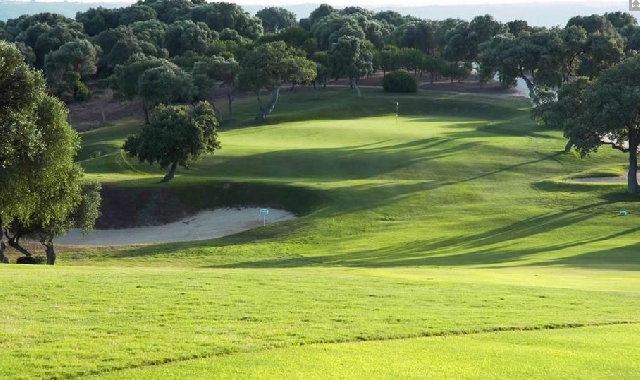 Not a single building affects its fairways and its greens are surrounded by forests, olive trees, oaks and pines. It offers breathtaking views over the Atlantic ocean and villages such as Vejer, Benalup and Medina, and on the African coast Spartel and Tangier. To play its 18 holes its always fun and surprising: deer, rabbits, ducks and other animals accompany the player throughout the route. The Clubhouse, with its neoclassical andalusian style and asian influence offers excellent golf services. Mycket trevligt ställe att besöka. Jättefin anläggning och mycket trevlig personal! Bättre skyltning till nästa hål. A very, very nice course and a great reception. Eftersom det är så tidigt på säsongen så blir betyget på banan kanske inte riktigt rättvisande. Greenfee is too expensive. Compared to others club conditions and Situation of course, not Best value at all. Beautiful golfcourse in a great natural surrounding. No noices, no houses. If you in the near of Montenmedio you have to play this course. Unfortunately on the back nine concentrated playing was difficult because of the loudness of a big party at the tent beside the clubhouse. The café was closet 1/2 past 6. We could not drink or eat anything. Teststeder ikke klippet. Faiways på de første huller ikke gode. Udtørrede. Trænger til i det hele taget til bedre vedligeholdelse. Bunkers ikke velplejede. Rødder hænger ud over bunkerkanten. En dyr bane i forhold til tilstanden. Ellers smukt beliggende og varierende huller. Banen ligger flot i naturen, men den virker slidt og dårligt vedligeholdt. Uklippede teestedet, ujævne fairways, men fine greens. Alle flag var røde, uanset placering på green. Utilfredsstillende, når der i baneguiden er angivet placering med røde, gule og hvide flag. Alt virker nedslidt og der ser ikke ud til at være midler til en tiltrængt opdatering. We played 9 courses in 9 days. Montenmedio was the best!! I was surprised, as I received the answer(Mail) to my request for a tee-time: 1. the confirmed time did not match the requested time-period; 2. the greenfee was higher than the fee, I have to pay with our golfhaftet-card. When I came personaly to the proshop, the lady offered us a better tee-Time and the greenfee was equal to the golfhaftet-conditions(50%). On the course was high traffic and in front of us we had two groups, who played very slowly. We had to wait nearly on each hole. The consequence was, that we(4 players in the flight) stayed nearly 6 Hours on the course. No help from the marshall. En mycket spännande och rolig bana. Bra fairway och mycket fina greener. The Club bar was closed when we finished our round. We had to drive to the hotel. The mashines preparing the golfcourse and the green either followed us or were just on the green while we playd the round. This was not good. During more than 9 holes we were accomponied on the fairways and on the greens as well by "working"-machines. Loud and disturbing!!! Impossible to find the for golf normally necessary concentration!!! Frustrating !!!! The "workers" did not care at all about us as players !!! An absolut "no-go" !!!!!!!!! I never want to play under such conditions. And all that on an really higher priced golf course !!! There was no previous information about working on the course during our planned play. In that case we really would have denied to play! As already mentioned, an absolut "no-go"!!!!!!!! Fortunately I never had such an "experience" before! The golf cours itself is interesting and well kept. But here they don`t care about players and their playing situations. Otherwise such (mentioned) situations could not be possible! Något ensidiga golfhål. Enda egentliga svårigheterna var träden. Greener och fairway får högsta betyg. Greenerna mycket bra. Fairway sämre. Något enahanda design. A very nice environment. I have already recommended this golf course to others. It's really a good course, we enjoyed the game. Very good place for Autocaravanas. Hope it Will works the same in the future.